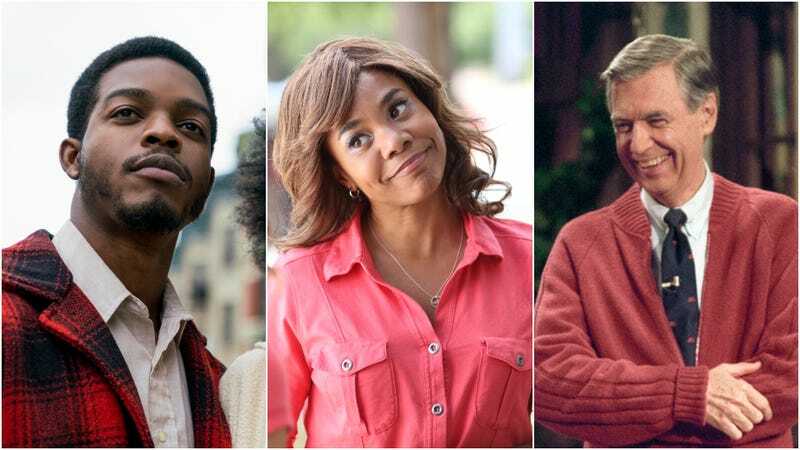 Left out or otherwise ignored (l to r): If Beale Street Could Talk, Support The Girls, and Won’t You Be My Neighbor? Nominations for the 91st Academy Awards were announced this morning; click here for the full list of this year’s Oscar contenders, and read on for The A.V. Club’s thoughts on what’s missing from and what’s pleasantly surprising about the nominees. This year’s Oscar nominees are imperfect as always, but also kind of great, in the way they likely confound any attempt to handicap the race. The two films with the most nominations are an acid-tongued costume comedy from the director of The Lobster and a black-and-white reverie that Alfonso Cuarón flecked with bits of his own life and filmography, plus shades of Fellini and Tati. A Star Is Born, once the seeming, crowd-pleasing heavyweight, failed to earn Bradley Cooper a Best Director nod. The two filmmakers involved in the most memorable Best Picture moment in Oscar history didn’t return to that category or Best Director, though you might’ve guessed it for Damien Chazelle, based on the way First Man lost steam in the critics’ and guild awards. But I am shocked by Barry Jenkins’ lack of a directing nomination and If Beale Street Could Talk’s absence from Best Cinematography—that movie’s a visual feast, and a stunning use of Jenkins’ custom of making his audience lock eyes with his characters. It’s a big morning for genre—what with Black Panther being the first superhero up for Best Picture and some surprising appearances from the Coen brothers’ Western anthology—but not if that genre is horror: I was holding out hope for Thom Yorke’s “Suspirium” in Best Original Song (Suspiria making Luca Guadagnino another favorite of recent Oscars passed over in 2019) and for Toni Collette in Hereditary. But Katie, I know you have many more thoughts about the Best Actress field and its lack of a terrified Collette. It’s true, I’m shaking my head at the lack of recognition for Toni Colette and her devastating performance in Hereditary. The depths of emotion Colette showed in that performance were masterful; I’m thinking especially of the monologue above, in which she exhumes a lifetime’s worth of profound grief and anger and resentment and slaps it all down on the kitchen table during a family dinner. But let’s be honest: I never really expected to see Colette’s name on the nominations list. Although regional critics’ groups across the country have bestowed Colette with Best Actress honors, the great horror crossover we were all so hopeful about last awards season continues to stall at a national level. And although I love her performance just as much as Colette’s, seeing Regina Hall on the nominations list for Support The Girls was a similarly long shot. And speaking of stalled progress, the lack of women on the Best Director list is, again, disappointing but unsurprising. Left off this year’s list of nominees is You Were Never Really Here’s Lynne Ramsay, who has a bold, punchy, attention-getting directorial style rather like that of Kathryn Bigelow, the lone woman to ever have won a Best Director Oscar. But Ramsay’s work also arguably leans too far into the avant-garde for the average Academy voter, resigning her to the fate of all true auteurs: getting nominated late in her career as a conciliatory gesture. Meanwhile, Debra Granik’s work on Leave No Trace, while elegant and controlled, is too quiet, and her film too small, to really catch voters’ attention. Same for Chloé Zhao and The Rider. That makes, for me, Marielle Heller’s lack of a nomination for Can You Ever Forgive Me? the biggest snub of a female director this year, given that leads Melissa McCarthy and Richard E. Grant were both nominated—and, well, actors don’t direct themselves. That being said, I’m thrilled for McCarthy, who’s always had the potential, just not the material, to turn in a great performance like the one she gives as Lee Israel in Can You Ever Forgive Me? I’m also thrilled for Yalitza Aparicio, whose nomination proves that, although Roma was her first acting role, her nigh-spiritual performance in that film was no fluke. As always, with the Oscars, it’s all about tempered expectations: Am I happy to see the mediocre Green Book and Bohemian Rhapsody taking slots from what I consider to be better films? Of course not. But once you start exploring the margins of the nominees list, some delightful surprises pop out: Hale County, This Morning This Evening for Best Documentary Feature. Border for Best Makeup. The Favourite and Roma, bold and beautifully crafted arthouse films that refused to be watered down for middle America, getting 10 nominations apiece. Spike Lee getting his first-ever Best Director nomination (which, by my own metric, makes him a true auteur). I guess, as a lifelong Oscars cynic, I’m used to looking for the bright side. What’s your philosophy on all this, Alex? Are you an Oscars pragmatist, like I am? What really interests me is the tension created by the changing face of the whole organization. The Academy’s recent diversity initiative didn’t just alter the demographic makeup of its membership, creating a much more inclusive (which is to say, less old, white, and male) voting body. It also gave the Oscars an undeniable infusion of good taste—the kind that resulted in Moonlight becoming the most legitimately arthouse Best Picture winner of all time. This year, you can see that new-old, hip-stodgy dichotomy all over various categories, where a very traditional Oscar favorite like Green Book ends up competing against artier choices like Paul Schrader’s First Reformed. It will be interesting to see which of these dueling sensibilities wins out, especially in Best Picture, which looks to these eyes increasingly like a standoff between Peter Farrelly’s outdated can’t-we-all-get-along race dramedy and Alfonso Cuarón’s visually stunning Roma. I’m still baffled, meanwhile, that A Star Is Born, a critical and commercial smash about showbiz, is no longer the clear frontrunner. Equally surprising: That the year’s highest-grossing nonfiction film—the heartwarming (if very conventionally constructed) Mr. Rogers tribute, Won’t You Be My Neighbor?—somehow failed to score a Best Documentary Feature nomination. (I assumed it was a done deal for the win; maybe the hagiographic crowd threw all their support behind the more explicitly timely RBG.) It’s strange, because this is otherwise very much a year when the Academy seems to have gravitated toward success stories. For all the derided talk of a Best Popular Film category, the Academy ended up throwing its weight behind plenty of giant hits, from Black Panther to the box office juggernaut that was Bohemian Rhapsody, maybe the most embarrassing Best Picture nominee since Extremely Loud And Incredibly Close. Speaking of that lineup, however much one wants to quibble with its quality (I count three films that have remotely no business being nominated), there’s no denying that these are all films that struck some kind of chord. Perhaps with Harvey Weinstein’s downfall, we’re moving beyond the era when respectable, middlebrow productions that nobody much cares about—your Lions, your Imitation Games—can fake their way into the race. The sad flip side of that is that the Academy didn’t show much interest in rescuing worthy box office “disappointments,” which is why the genuinely terrific First Man did even worse than everyone thought it would and why Steve McQueen’s crackerjack but underperforming Widows couldn’t score a single nomination, even for Viola Davis’ commanding lead performance. As far as unexpected snubs go, I’m surprised that Bo Burnham failed to nab an Original Screenplay nod for his middle-school-is-hell comedy Eighth Grade and that Timothée Chalamet missed the cut for his supporting performance as a meth-addicted son in Beautiful Boy. (However much younger the Academy is skewing, they still apparently can’t totally relate to movies about teenagers.) Way more shocking, though—at least to me—than the exclusions are the inclusions. Was anyone expecting Willem Dafoe’s turn as a 25-years-younger Vincent van Gogh to slip into the Best Actor lineup? And even with all the Roma love out there, there was no guarantee that the Academy would find room to nominate two of its actors—a rare feat, for a foreign-language film. Allison, did any of this morning’s nominations surprise you, pleasantly or otherwise? Like Katie, I’m inclined to be not so much surprised by as resigned to the exclusions that otherwise might make me gnash my teeth. Yes, I’m disappointed to see performances like Hugh Grant’s giddy, dastardly turn in Paddington 2 overlooked, and yes, I wish Sandi Tan’s fascinating Shirkers had snuck in alongside Minding The Gap and Hale County This Morning, This Evening in the documentary category, but those were omissions with which I had already made my peace. Not so with this next one: Like you, Alex, I was honestly startled by the total exclusion of Bo Burnham’s wonderful Eighth Grade, particularly in the Original Screenplay category, and while Elsie Fisher’s failure to get a nod for that film wasn’t exactly shocking, my poor, dumb heart harbored hope that she might have been included in a category that has often found room for newcomers. An equally frustrating surprise: Where’s Rachel Morrison? Black Panther’s well-deserved technical nods for Production Design, Costume Design, and the two Sound categories are all very well, but what about the cinematographer who made the whole thing look so good? Rightly nominated for Mudbound last year—the first woman nominated in the category, ever—her nomination seemed the likeliest of all possible Black Panther nods. There are some worthy contenders in that category, to be sure, and it’s probably Cuarón’s to lose, but it would be nice to see Morrison in the mix. Oh well, back to the dudes, I guess. Still, it’s hard to be too frustrated when the big stories of the day are the dominance of Roma and The Favourite. Once more, with feeling: The Favourite, a film from the guy behind The Lobster—which sees Emma Stone wearily masturbating an empty-headed fop while monologuing her strategic thinking and Olivia Colman as Queen Anne say, “I like it when she puts her tongue inside me”—has 10 Academy Award nominations. The Favourite, in which most of the men are an afterthought, in which Rachel Weisz wears the drag of a lord and draws a mud mustache on her face as a power-play, which is feminine, weird, queer, upsetting, and blackly hilarious, which tackles trauma and fashion and pet ownership and in which people vogue, which ends with death rabbits, is a legit Oscar contender. That’s fucked, and amazing. What a time to be alive. Meanwhile, I am ignoring the reality of the Burning snub. It never happened. The A.V. Club’s list of the 25 best films of 2018—a list that agrees with the Academy in some ways, and completely differs in others—can be found here. Should the Best Picture Oscar be considered the award for the best producing?